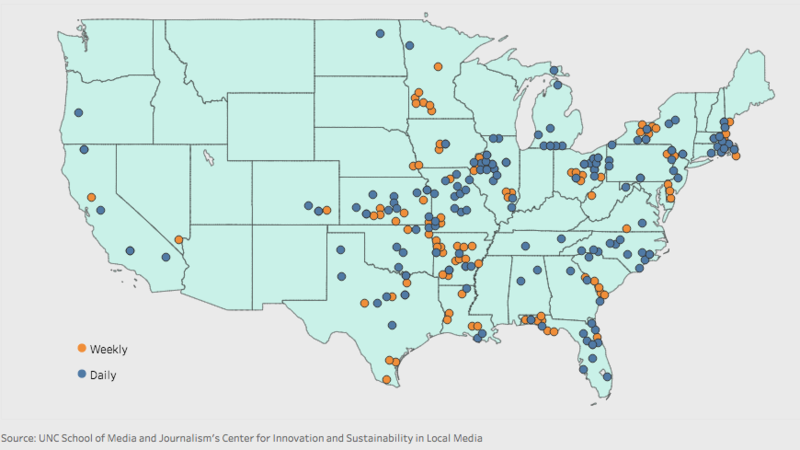 New Media/GateHouse owns 451 papers in 34 states. GateHouse has traditionally sought papers in small and mid-sized communities with little media competition. Historically, roughly 40 percent of GateHouse’s newspapers have been in rural or low-income communities, with limited media competitions such as regional broadcasting outlets or other news publications. In 2014, the average circulation of its 359 papers – two thirds of which were weeklies –was less than 9,000. 16 Since 2016, it has shifted its strategy and begun targeting daily papers in larger, metro areas such as Providence, Rhode Island; Columbus, Ohio; Austin, Texas, and Palm Beach, Florida. The Austin American Statesman and Palm Beach Post, which GateHouse acquired in 2018, have a circulation of more than 86,000 and 77,500, respectively. 17GateHouse papers are primarily located in states east of the Rockies – in the central and upper Midwest, South, Mid-Atlantic and New England regions of the country. With print advertising and circulation continuing to decline at GateHouse-owned papers, and digital revenue lagging that of competitors such as McClatchy and Gannett, shareholders are also are beginning to take notice. Stock in New Media/GateHouse sold for as much $25 a share in March 2015. In August 2018, it sold for $16. All of this calls into question how sustainable New Media/GateHouse’s aggressive acquisition and regional roll-up strategy will be long-term, especially as the company pivots away from smaller markets with less competition and focuses, instead, on acquiring dailies in larger, metro areas with numerous media competitors.